This Human Rights cause is something I believe in strongly. 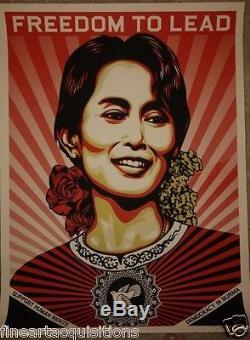 I created this portrait of Aung San Suu Kyi to raise awareness of her situation and the overall situation in Burma. First introduced to the public on June 19th, Aung San Suu Kyi's birthday. Add a map to your own listings. The item "Shepard Fairey Original Signed Limited Edition Freedom To Lead Obey Giant Aung" is in sale since Tuesday, April 5, 2016. This item is in the category "Art\Art Prints". The seller is "picturesonwalls" and is located in Los Angeles, California. This item can be shipped worldwide.